22 pp. Roman, 131 pp. A proverb is as much the property of a people as its language, it could never be invented. Proverbs, proverbial sayings and maxims originate from a particular experience or observation which people make in their specific environment, and they became a proverb only by repeated, often daily usage by the members of an ethnic/linguistic group. They reflect insights into the mechanisms of life, hence they produce wisdom and courage which may help to master situations of general life problems. They also have the function of accumulating the knowledge and perception of ancestors and setting moral standards for present and future generations. In traditional Africa, there was no wise speech without proverbs. Wise elders were not addressed in ordinary language in former times. The use and mastering were a measure of culture and manners. 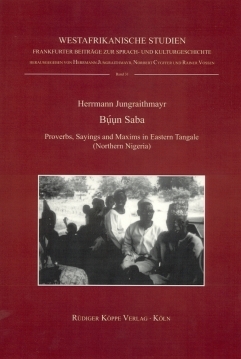 This collection of about 400 items of oral literature in the Tangale language – belonging to the Chadic branch of the Afro-Asiatic language family and situated in the Northern part of Nigeria – have been compiled with the help and contributions of many East Tangale speakers, men and women of different age. As to their degree of applicability and semantics, the proverbs may differ considerably from each other, having a more general character or reflecting very specific situations and contexts which can only be understood by a cultural insider of a given ethnic group. A part of the proverbs is accompanied with drawings visualising the meaning of the Tangale sayings. Búun Saba – literally meaning arrow of word – shows just a small sample of the real wealth of proverbs that the Tangale people possess. It is the outcome of a first endeavour which the authors hope will encourage further activities in this fruitful field of the collective memory culture of a Nigerian people. Another interesting research area would be comparing Tangale proverbs with Hausa proverbs or with the proverbs of other neighboring ethnic groups. With this book - and with his other publications on Tangale - Herrmann Jungraithmayr has laid a solid foundation. Younger scholars - preferably some learned Tangale speakers - can and should build on it.